After three weeks where I've been incredibly pushed for time, this week has been a little quieter and TLFG is back to normal service with all its normal features restored. The next few days will be amongst the most crucial of the season with Premier League and EFL teams preparing for their last two or three matches. Below them, all leagues from the fifth to the 10th tiers will end on Saturday with the play-offs getting underway early next week. There are also a few minor cup finals over the next few days to keep you going before a huge Sunday of women's football ends the week - Chelsea entertain Lyon in the Champions League semi-finals whilst Arsenal have the chance to win the FA Women's Super League at Brighton. Over the last few weeks, I've been so pushed for time that I've had to delay mentioning a few things that readers have sent in. One of the most important came from Nick S who made me aware of a charity sleep out taking place at Leyton Orient in aid of World Child Cancer. If you'd like to take part then follow this link for more details. We're also lucky enough to have a video from our old friends at 'Two Men In Search Of The Beautiful Game' who recently paid a visit to Clapton CFC - probably the biggest club anywhere in the English 12th tier. On a personal note, my football week saw me take in two games. First up on Tuesday I headed to Griffin Park to watch Brentford B take on Harrow Borough in the Middlesex Senior Cup Final. Boro acquitted themselves pretty well and at 1-0 down with eight minutes to go they still had a chance. Sadly those remaining minutes saw a collapse which resulted in them ultimately losing 4-0. Despite the scoreline, it still provided a memorable night for the fans and players of the Evo-Stik League side. Once again I'd like to put on record how much I'd like to see other top London clubs put development sides into their local county cup competitions as they used to do in the past and how many northern clubs have always done. 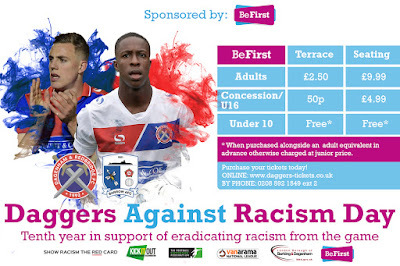 It gives the youngsters some competitive football against clubs who actually want to play them - unlike the Checkatrade Trophy. 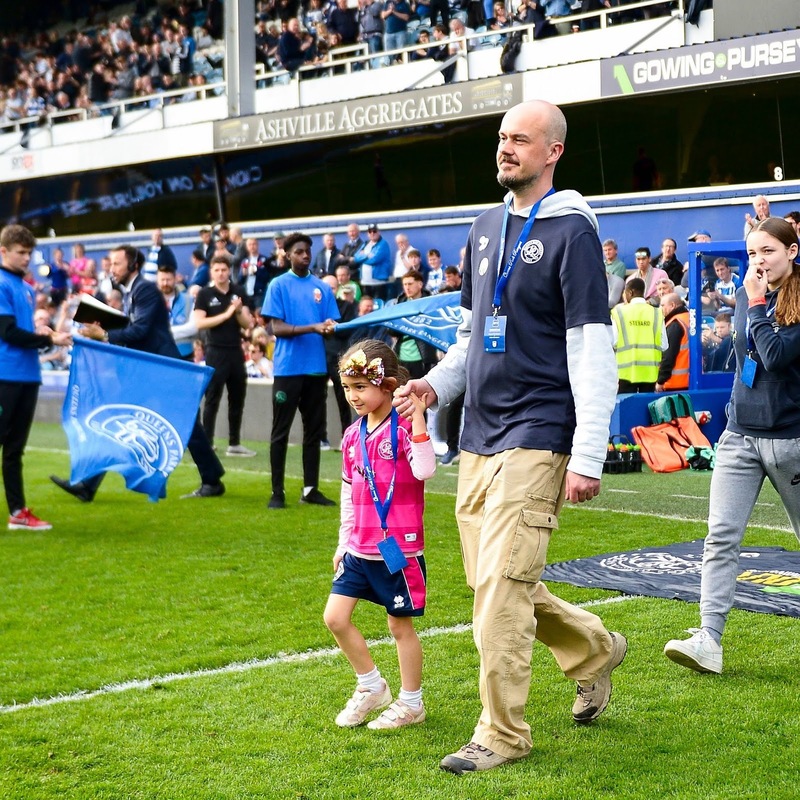 On Friday I took my daughter to Loftus Road to see QPR play Blackburn Rovers, hoping that her status as good-luck charm would continue but it was not to be. The side that played were nowhere near as committed or as good as the one which thrashed Swansea last Saturday and they duly lost 2-1 - it could've been much more. QPR suffered another defeat at Derby on Monday but thankfully, Rotherham lost again meaning Rangers are now mathematically safe from relegation with two games to go - phew! Meanwhile, Harrow Borough bounced back from their cup final disappointment with a 9-1 thrashing of a hapless Staines Town side who were relegated weeks ago. With one final match at Salisbury on Saturday, the Boro could still finish as high as seventh which is way beyond what I was expecting at the start of the campaign so congratulations to everyone involved. In other personal news I completed my 50th different parkrun at Valentines park in Ilford on Saturday but earlier in the week I missed out on a promotion at work so it's been a bit of a rollercoaster few days. Lastly this week, many thanks to Peter S from the Netherlands who donated to TLFG's lung cancer fighting fund this week. I really really appreciate it and thanks also for your kind words. The highlights of the next few days include some crucial games in the Premier League and EFL and the final games in many of our local non-league competitions too. It's been a crazy week and despite getting up at around 6am today to work on this, I've only been able to produce the match maps. Hopefully I'll get the chance to put a bit more info in over the next few days but it looks like being one of those weeks where I can only produce the bare minimum - apologies. Lastly from me, many thanks to Scott T who donated to TLFG's lung cancer fighting fund this week. I really really appreciate it. The highlights of the next few days include action in the Premier League and EFL and loads of games in our local non-league competitions too. Greetings one and all - I hope you're well. I'll keep this pretty brief as I'm on early shifts at work and I'm well past my bedtime! The main thing to note about the week ahead is that it's an international break which means there are no Premier League or Championship games - in fact there's only one EFL game at AFC Wimbledon. With games a little bit thin on the ground, I've included a few more than usual from outside London or from lower levels - you can find them all on the match maps. The main match of the week is England's Euro 2020 qualifier against the Czech Republic at Wembley whilst over in N17 on Sunday, Tottenham Hotspur host the first test event at their new stadium - sadly getting tickets for both events will now be very difficult or probably quite expensive as the first is sold out and the second must be close, with any available tickets going to members and season-ticket holders only. 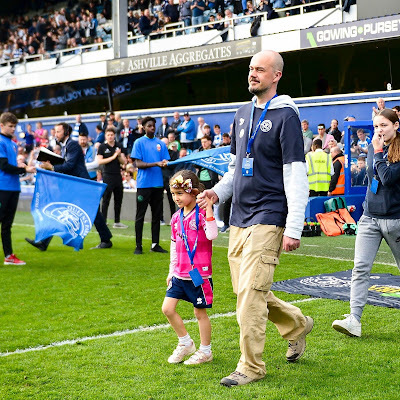 With all the big teams having the week off, it's a great time to check out a non-league game and/or a women's match - Chelsea's Women's Champions League quarter-final against PSG being a particular highlight on Thursday. On a personal note I got to go and see QPR play Rotherham United on Wednesday. 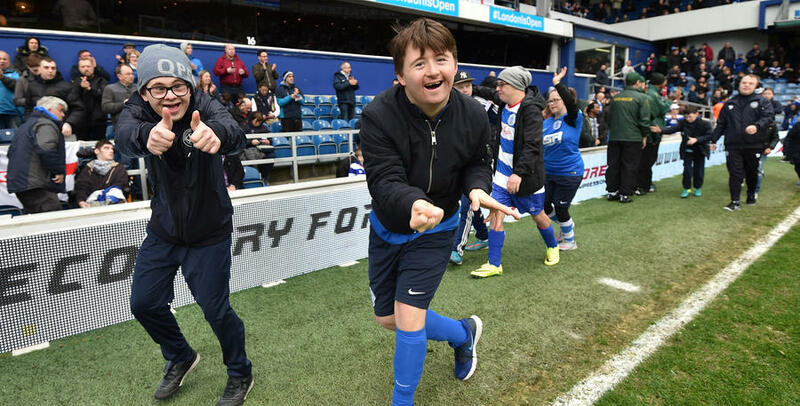 The Millers are battling relegation, hadn't won away all season and hadn't won at Loftus Road since 1951 but on Wednesday night they created a bit of history and did just that as they ran out 2-1 winners courtesy of a 94th-minute goal. It was one of the worst games of football I have ever seen - with both teams playing highly uninspiring stuff. How we got three goals (one of which was a cracker) I'll probably never know. Thankfully Rangers recovered from 2-0 down to get a very useful point at Hull City on Saturday to partially sweep the awful midweek result somewhat under the carpet. The best thing about the Rotherham game was getting to meet long-term TLFG reader Moran M from Israel who came on a multi-game tour last season and was back for another one this year. With trips to various clubs up and down the divisions during his stay, it was a bit of an embarrassment to see him visit W12 for this one. 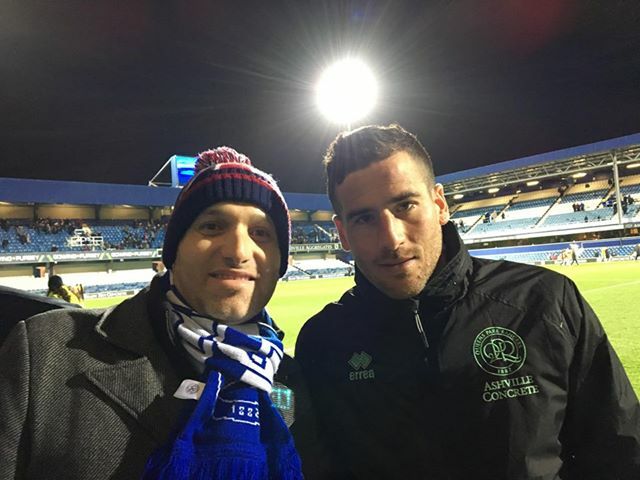 However, QPR's on-loan striker Tomer Hemed is one of Moran's favourite players and after I advised him to make a banner to catch his attention, the Israeli international came over for a quick chat and a photo after the game - so what could have been a night to forget, ended up being quite the opposite. As mentioned last week, nominations and voting are now open for the 'Football Blogging Awards'. This is something I've never got involved in and I'm not even sure which category this blog would fall into but I got an email from the organisers giving me the info so I might as well give it a go so if you could put a vote my way I'd really appreciate it. Lastly this week, many thanks to Chris H who donated to TLFG's lung cancer fighting fund this week. I really really appreciate it and thanks also for your kind words. The highlights of the next few days include some international football plus some action in the EFL and loads of games in our local non-league competitions too. Hayes & Yeading United v Bracknell Town @3pm - there's no question about which is the game of the week in the eighth tier as the top two meet at the SkyEx. However with H&YU 14 points clear at the top, it's surely just a case of dotting the i's and crossing the t's as far as their title bid is concerned. Whatever happens, there should be plenty of goals - the clubs have banged in a whopping 200 between them in the league this season! Charlton Athletic v Manchester United @2pm - the only game in the London area you'll be able to get into is this women's second-tier match but it should be a cracker as it features the recently created Manchester United side who are second and Charlton who are third - the top two go up. Loads to play for!